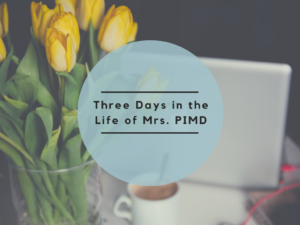 Three Days in the Life of Mrs. PIMD | Passive Income M.D. 7:15am – Toddler’s up. Get ready, eat breakfast, and RUSH RUSH RUSH out the door by 8am. 8:40am – Patients still not ready (whew), so finally sit at a computer to check and answer some emails. 12:30pm – Wrapping up clinic (even the patient who came 1 hour late, no problem) and clear out my inbox. Notice I missed a few texts/messages and answer them when walking to the car. 12:45pm – Phone call on the drive home with a friend who has some questions about joining the business. 4:00pm – Stop by the nearby park to swing and catch up with some neighbors. 5:00pm – Pick up my daughter from preschool. 9:00pm – Shark Tank on DVR, reading/computer time (some messages, some online shopping). 6:30am – Wake up, nurse baby, FB time. 7:15am – Toddler’s up. Get ready & eat breakfast. No clinic today so no need to RUSH. Yay! 8:45am – Drop off at preschool. 9:00am – Sit down in front of my laptop and surf FB for post ideas while listening to a training video in the background. Send out some messages and texts. 10:00am – Get caught up chatting with a friend I haven’t talked to in forever. 10:30am – Baby’s up. Take him and dogs to a nearby coffee shop. 7:15am – Daughter’s up, Eat breakfast. It’s the freakin’ weekend, YAY! 3:00pm – Head over to a girlfriend’s to help her with her networking party. We have a few mimosas. 8:00pm – PIMD’s sister comes over to watch the monitors, while PIMD and I go out and grab dessert. 10:00pm – Finally some laptop time – check emails, input orders, catch up on messages, peruse FB and team pages, SLEEP. So that’s it! Three days in the life of ME! When I think about my schedule two years ago, it was definitely not as varied, FUN, or fulfilling. It was all about rush rush rush, all the time, and just getting through the day. I was always tired and irritated, and I felt like I wasn’t doing a very good job at anything – at work or at home. 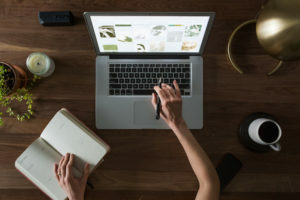 Now, because I’ve built my home business to a point where I can cut back on my clinic hours, I can focus on my patients at hand a few mornings a week and not get burnt out from the grind. I really enjoy going to work now! And of course, I love spending more time with my kids. I rarely got to go on walks and enjoy weekdays with my daughter when she was young; I am now making that up with my son. And because PIMD has been able to cut back on some of his hours too, our weekends are also better. While before he might be working every other Saturday, and I would be struggling to keep up with an active baby alone after an exhausting week of work, we are enjoying our weekends together as a family more often, like “normal” people! Now, this all did not just happen overnight. Over the past two years, I have definitely honed my activities to the essentials and learned to plan out my days more efficiently. It was really tough at the beginning – before I went part-time – juggling a full-time job, kids, AND learning the ins-and-out of this business (how to be confident, how not to be weird, how to balance friendships, networking, and business, etc. I’m still learning to this day!). But – as you can probably tell – I definitely think it has been worth it. This is just a full (and effective) schedule. I would need more sleep then that. They have toddler ballet classes?! If I go without a nap I will make sure no one else sleeps because I am a toddler too!! !